Arial view of Mineirão Stadium in Belo Horizonte, Brazil, Photo by Alberto Andrich.Developed as Rio’s primary 2016 Olympic and Paralympic Games competition center, Barra Park will continue to serve as the city’s largest legacy sporting venue. With an expanse of 1.18 million square meters, Olympic Park includes nine sports venues. WSDG designed the acoustic program and audio and video systems for the stadiums and all public areas, a total of 300,000 square meters (3,000,000 square feet). Mission specs encompassed: inclusive acoustical treatments, a comprehensive sound system, serving the soccer field, audience and VIP rooms, offices, internal spaces and access areas; video systems, including four large LED video walls (85 square meter/915 square feet) each; and score board screens, time clock, and media video displays throughout the complex. Also included were fully integrated audio and video control rooms, as well as acoustics, sound and video systems for the three tennis arenas plus practice fields (10,000, 5,000 and 3,000 seats); the 18,000 seat aquatic arena plus warm up pool; and, audio and video systems for the COT arenas (16,000 seat basketball, 10,000 seat judo, and 10,000 seat wrestling arenas). 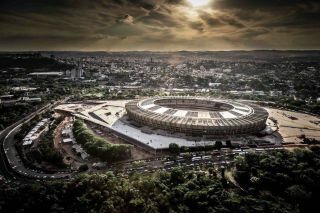 Originally built in 1965, the 62,160 seat Mineirão Stadium is Brazil’s second largest sports arena. Designed to generate benefits long after the 2016 Olympics is history, officials immediately recognized the need for a significant audio/video and acoustics upgrade to enable the 51-year-old complex to comply with FIFA technical requirements. “Our primary Mineirão concerns focused on the level of sound comfort and intelligibility in relation to RT60 reverberation time,” Cipriano said. “Our sophisticated simulation programs enabled us to assess and ‘auralize’ the entire complex. We identified extensive sound reflections throughout the arena and concluded that acoustical absorption was required at the inner ring of the audience sector to achieve the required STI values. Speaker positioning was defined for the internal and external areas, and for numerous zoning maps, which can now be individually controlled for increased flexibility and security purposes. All audio and video systems, and control room speaker selections, were designed to meet FIFA, international security and, Olympics Committee standards. Additionally, we recommended incorporating a video wall instead of a traditional scoreboard,” he added.